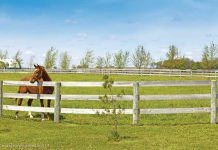 Home Stable Management Horsekeeping Are Your Pastures Safe? Not every thing growing in a pasture is safe for a horse to eat. Noxious and invasive plants are not only taking control of hundreds of acres of public lands but individual pastures where horseowners turn horses out for what looks like lush green grasses to graze. Knowing what is noxious, what is invasive and what is unsafe grazing for one’s horse can be a challenge. What is a noxious plant? An invasive weed? What do the plants look for? Where do they grow? And just how can this or that plant affect a horse who has grazed some of it? According to Bonnie Davis, respected clinician and freelance writer, who has worked with the National Park Service and California Department of Food and Agriculture on noxious and invasive plants, “A noxious plant is one that will build up toxic levels in a horse’s system which can seriously injury or kill the horse. 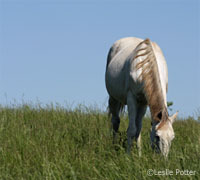 Invasive plants are those that as they grow push out the normal or native plants which horses like to graze. Both plants are classified as weeds and often can be found not only in pastures but as landscape plants around homes, barns, buildings and even along fence lines. “Every horseowner should have a basic knowledge of these plants. Anyone who is planning to landscape, involved with pasture management or just allowing a few hours each day for a horse to graze should be capable of recognizing individual plants. 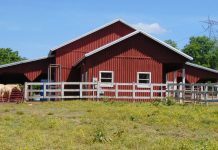 Even landscapers often don’t know which plants to avoid around a barn or even a driveway where fallen leaves can be blown into pastures. The best way for the horseowner to protect equine stock is to understand the various plants themselves,” Davis stated. “Horse Owner’s Field Guide to Toxic Plants” includes the 100 most common and toxic plants found in pastures, backyards, around barns and even along trails. Each plant has a full color photo of leaves or flowers, description, geographic distribution and locations. Not only are trees, shrubs and bushes included but vines, ferns, palms and wildflowers. Researched and compiled by Sandra Burger, Dr. A.P. Knight, leading horse poisonings expert, lent his expertise on how to recognize poisoning symptoms and what steps you or your vet should take if one suspects a horse has eaten a toxic plant. For more information on “Horse Owner’s Field Guide to Toxic Plants” and ordering, contact Two Horse Enterprises, /redirect.php?location=http%3a%2f%2fwww.twohorseenterprises.com%2f, PO Box 15517, Fremont, Ca. 94539. Or call (510) 657-5239, e-mail horsecamping@comcast.net for a FREE Two Horse catalog. Read more on pasture safety and pasture maintenance. Thank you for this article. A lot of good points for horse owners to think about. Thanks for the information! I’m going to check out the field guide. Most horses know which plants to eat, but its the young one that have to taste everything. Or the one that have nothing to eat that will try to eat the wrong stuff.